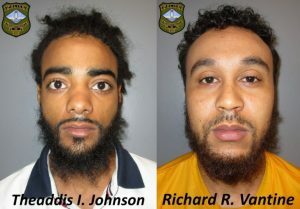 Rehoboth Beach Police Department say they have arrested 22-year-old Theaddis Johnson of Milford and 22-year-old Richard Vantine of Georgetown following a traffic stop in which they seized a loaded 9mm handgun. Around 4 p.m. on Saturday, March 30, an officer observed a white Chevrolet Impala with multiple cracks in it’s windshield traveling westbound on Rehoboth Avenue approaching the traffic circle. The officer caught up to the vehicle at which time the vehicle aggressively turned off the roadway into a private driveway where officers conducted a traffic stop. Upon approaching the vehicle, the Officer smelled a strong odor of fresh marijuana coming from inside. The officer identified the individuals despite Vantine initially providing a fictitious name. Officers removed the vehicle’s occupants and conducted a search. They located in excess of three ounces of suspected marijuana throughout the vehicle and on the occupants. The marijuana was packaged in multiple bags and containers. Additionally, Officers discovered a backpack containing a loaded 9mm semi-automatic handgun and additional ammunition for the gun. Once officers discovered the gun, they say Vantine fled the stop on foot and was able to escape custody. Additional units from the Dewey Beach Police Department and Delaware State Police responded to the scene. Responding units located Vantine just after 4:30 p.m. and took him into custody without injury or incident. Johnson was arrested and charged with one felony count of carrying a concealed deadly weapon and one misdemeanor count of possession of marijuana other than for personal use with an aggravating factor. Johnson was released on 5,500 dollars unsecured bail. Vantine was arrested and charged with one felony count of carrying a concealed deadly weapon as well as one count of possession of marijuana other than for person use with an aggravating factor, one count of resisting arrest and one count of criminal impersonation. Vantine was committed to Sussex Correctional Institution in lieu of 6,500 dollars secured bail.